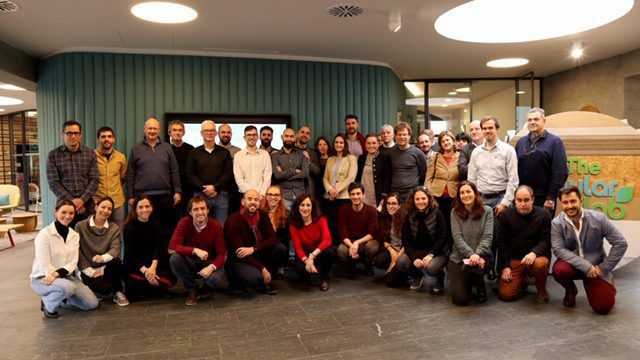 The European project led by the ITENE technology institute held its general meeting at TheCircularLab, the Circular Economy innovation centre at Ecoembes. There, Ecoembes had the opportunity to present two of its projects most closely related to ‘PlastiCircle’, namely SmartWaste and Plant 4.0. TheCircularLab, the Circular Economy innovation centre at Ecoembes, was tasked with hosting the general meeting of the ‘PlastiCircle’ project, the European initiative involving 20 institutions, represented by 8 countries, which advocates for applying the Circular Economy to plastic packaging. At the meeting, which took place on 22 and 23 January, future innovative projects for optimizing and managing this waste were debated, proposed and devised. There, Ecoembes was able to present two of its projects most closely related to PlastiCircle, namely SmartWaste, a smart platform for managing the packaging collection, sorting and recycling processes, created in collaboration with Minsait, and Plant 4.0, designed to modernize the treatment processes in Spain’s sorting plants. During the 19 months that the European initiative has been underway, important innovations have been made in the area of waste collection. On the one hand, smart containers are already available. SAV, the Farmers Association of La Vega, and ITENE have been working to develop these containers, which have volume sensors and labellers so that the public can identify their bags and actively participate in the validation trials. In the case of ITENE, its work was two-fold, since it has also been the company in charge of optimizing the software to control the collection routes based on driving modes in order to save fuel and time during the collection process. On the other hand, PICVISA, another partner in the project, has been in charge of optimizing the optical detection software in order to more accurately separate plastics. All these innovations will be transformed into a pilot project that will be trialled in the cities of Alba lulia (Romania), Utrecht (Holland) and Valencia. In the case of the Spanish city, it will be the neighbourhood of San Marcelino that will host the first sensorized containers in which residents can deposit their waste. Finally, the tasks of communication, training and publicizing the results lie in the hands of different partners, such as ICLEI, the organization of local governments for sustainability, PlasticsEurope, the business association of polymer manufacturers in Europe, SINTEF, one of the most important technology centres in Europe, and KIMbcn, experts in innovation.